Hardscapes created with pavers help define your landscape with function and beauty through their various colors, textures and shapes. Creating these spaces requires an attention to detail and knowledge of the products and materials. Dean’s Landscaping has experience in creating customized hardscape paver patios, porches, driveways, walkways with various types of paver products. From natural stone to engineered concrete or clay pavers, we have a solution for your needs and the experience to go with it, giving you a great product you can be proud of. In order to achieve a quality and long lasting paver project, proper installation techniques must be completed. The first step is excavation of existing soil, to proper depth within the paver area. The next step is installation and compaction of the gravel base. Proper base thickness and compaction is key to the success of a paver project. Most paver failures are due to improper base thickness and compaction. The next step requires the installation of bedding sand/gravel which will act as the final layer of base. The final steps include the installation of pavers, cutting in borders, and proper installation of edge restraints and application of polymeric sand, which lock the pavers in place and keep weeds from growing in the joints. Whether it’s a 10’x10’ patio or 12,000 sq. ft. driveway. 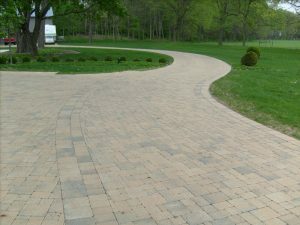 Dean’s Landscaping has the knowledge and experience to design and install your project properly, in order to last many years through the freeze and thaw cycles in the Miami Valley area Dean’s Landscaping employs ICPI certified paver installers to ensure the very best quality from start to finish for your project. Thank you for your expertise and patience in building the paver patio and sidewalk. It looks great and is evidence of your dedication to your job. I know the weather was not great, but you still took time to make it look great! Thanks again. Let’s get started on your paver project.